Nobody visits Napa and says, "Honey, doesn't this look just like Bordeaux?" Not unless they're looking at the grapevines with an ampelographer's eye. Up close, it's very much like Bordeaux indeed. Here, where the free vintners of the West can grow any grape their heart fancies, unbound by continental traditions and proscriptions, it's Cabernet Sauvignon followed by Cab, Cab, Cab, Cab—Merlot—Cab, Cab and more Cab. Hey, why stir the pot? The era of experimentation is over. If you don't know the story about the guy who banked on Napa Valley Beaujolais Nouveau, lost his shirt and was sent packing back to Chicago, his name might ring a bell: Charles Shaw. Enter Chicagoans John and Ellen Benish, who had recently enjoyed a tour of Italy. Simply loved it. When they came to St. Helena, they said—wait for it—isn't this just like Tuscany? In 1994, they purchased the former estate of—see it coming?—Charles Shaw, and instead of the same-old, actually planted the grapes that thrive in Tuscany, Campania and Umbria. 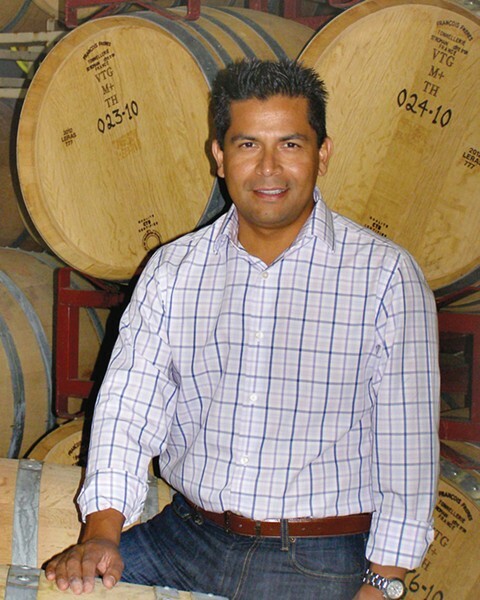 "Sangiovese is a very tough varietal to make," says winemaker Leo Martinez (pictured), who was promoted after sticking with Benessere for 12 years. Fortunately, he's got a "spice rack" of nine clones to work with, oak fermenters and an all-gas system that moves wine gently from barrels. To make sure he gets it right, he lives onsite during crush to babysit fermentations, taking their temperatures at 2:30am. The bright, cherry-vanilla lollipop of a 2009 Estate Sangiovese ($32) makes it look easy. The 2011 Carneros Pinot Grigio ($22) sparkles with green-apple glitter; the 2008 Estate Sagrantino ($75) is supple and rare; the pretty, perfumed 2010 Aglianico ($40), a glimpse of what the Romans enjoyed as the legendary falernum, and the 2009 Sorridente ($50) and 2008 Phenomenon ($50) are plush, grippy super-Tuscan-style blends. More fun than your average Napa Zin, the floral 2009 "Black Glass" Estate Zinfandel ($32) is wild raspberry patch in a glass, and the 2010 Holystone-Collins Old Vine Zinfandel ($35), from a neighbor's vineyard where Benessere parks a red truck with their "Winery Here" sign, a jelly jar full of cherry, plum and raspberry—plus finesse. Don't look for the iconic gazebo from the "2-Buck" label. It's gone. As for the Benishes, they jet in for a few weeks each year. Most of the year, it's just a small, outgoing crew and their dedicated winemaker, left to make a spaghetti Western stand for serious Cal-Ital wine in the heart of Cab country. Benessere Vineyards, 1010 Big Tree Road, St. Helena. Daily, 10am–5pm. Tasting fee, $20. 707.963.5853.